Management through and by sectors has emerged as the primary mechanism for managing the Multispecies Groundfish Fishery in the Northeast United States. Sectors are cooperative associations of fishermen that in theory can pursue their own community-based goals but that in practice have tended to operate more like individual quotas. Based on interviews with groundfish sector managers, this paper examines the emergence of sectors as a new institutional form in the Northeast, and the rapid reorganization of the industry that has occurred in the wake of sectors. Some sectors have depended on existing relationships, particularly in sectors based on common ports, ethnicity, or kinship. But sectors also call on new sets of relationships and roles, such as the role of sector managers as important new bridges or “boundary agents” between government and industry. This paper reviews the differences and commonalities in the goals and objectives of different sector groups, the challenges and opportunities fishermen have faced adapting to the sector system in the context of reduced allocations, as well as the changing importance of different institutional forms in the management of the fishery. The sector system has been an experiment in decentralized and collaborative management, but in a context of increasingly privatized resources, rendering challenges and opportunities to fishermen in a rapidly changing socio-ecological environment. The groundfish fishery—a complex of bottom-dwelling species including Atlantic cod, haddock, yellowtail flounder, and Atlantic halibut—was one of the first colonial endeavors in New England, and remains its iconic fishery. Despite the implementation of the first Fishery Management Plan for groundfish in 1987, however, “most New England groundfish stocks have been heavily exploited and overfished for decades” (Brodziak et al. 2008: 358). The history of groundfish management in the Northeast US, which in addition to sixteen implemented amendments includes fifty regulatory adjustments (called frameworks) to the management plan, is also one of frequent industry opposition, resentment, criticism, and actual lawsuits (see overview in Acheson 2011). Although the reasons for overfishing may be complex, observers have pointed to a number of factors related to the management regime per se, including inconsistent policies and incentives that encouraged early fleet expansion (Acheson 1984), reliance on indirect controls, which ineffectively limited fishing effort (Anthony 1990), and the need for better integration “of science, management, and harvesting” (Hennessey and Healey 2000: 210). Groundfishermen are highly diverse, from size of operation to type of gear to choice of fishing grounds. Such diversity would seem to reduce the likelihood of fishermen coming together to form groups to manage their resources, as Ostrom’s (1990) well known design elements would suggest and as some have specially argued for New England groundfishermen (Acheson 2006). Yet robust elements of social capital, often defined in terms of social networks, norms and relations of trust that enable cooperation and collective action (e.g. Pretty and Ward 2001), have been found in the groundfish industry (Holland et al. 2010), while community-based processes such as cooperation and mutual dependence have been found to characterize a diverse economy in fishing communities in New England (St. Martin 2005, 2007). 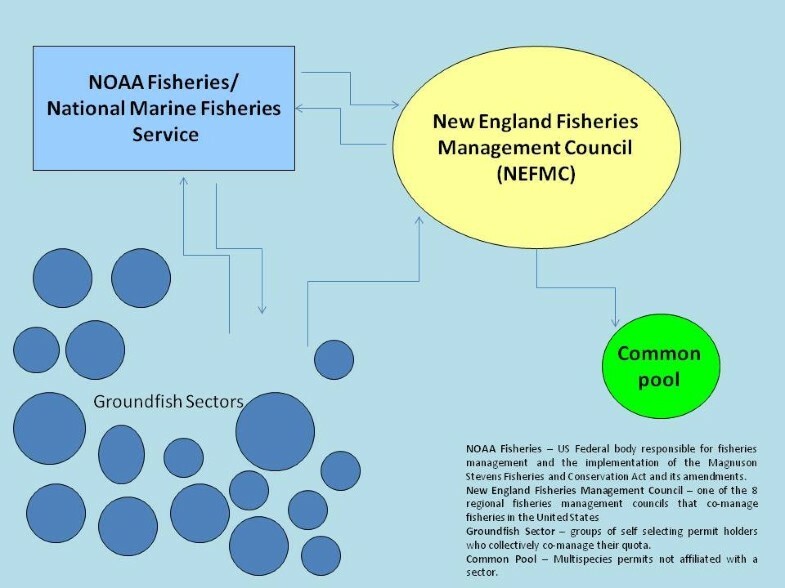 While elements of participatory decision-making have been noted in previous regulatory actions of the groundfish industry (Hall-Arber 2005), since 2010 the allocation of the quota of New England groundfish has occurred primarily through the use of sectors, cooperative associations of fishermen (Figure 1). The use of sectors for the groundfish fishery was first proposed and used by a local, community-based user group, but the general strategy soon became part of a wider government promotion to consider “catch shares” as a management tool more generally, a complicated transition that we detail in the next section. Needless to say, this context of change and the possibility of further reductionsa in fishing opportunities for fishermen created enormous challenges for fishermen seeking to preserve their fishing businesses and livelihoods. As such, both the management change with its ensuing need to create new structures and practices, coupled with concern over how the allocation of quota would be determined, provoked significant conflict, concern, and expectations (Holland et al. 2013). For some, sectors were the lesser of two evils. For others, they were a medium for more decentralized and community-oriented management. And for still others, especially those struggling under low allocations and those concerned about a consolidating industry, the management change was despised. Institutional map of groundfish management. But such forms of management also mark a more general emergence of hybrid institutional forms of environmental governance that involve different kinds of actors across spatial scales, such as private-public partnerships (Lemos and Agrawal 2006). As Bulkeley (2005) has argued, such hybrid efforts have involved not only a “rescaling of environmental governance” but may also create “new spheres” of authority as well, in which the very nature of activities undertaken may change. While the decentralization embodied by such hybrid forms has sparked hope for greater democratization of decision-making, issues of accountability and power imbalances mean that “contingent outcomes of contemporary shifts in governance, therefore, depend crucially on the ways local actors mobilize and establish alliances across sociopolitical and administrative scales of governance” (Lemos and Agrawal: 305). The sector system, though controversial, is a new direction in fisheries management in this region not only because it changed from an effort-based to a catch-based system, but because it represents an institutional change in governance that has necessitated such mobilizations and alliances. In the midst of crisis, fishermen have had to work together more formally, while at the same time sectors have also provided an opportunity for fishermen to organize around issues and practices far broader than quota allocation per se. This paper, based primarily on interviews with sector managers, seeks to explore some of the important dimensions of this institutional change: the background in which it evolved; the context in which it is has functioned; and the expectations for future management. In particular, we have sought to detail the processes that actors have had to adopt or to make in order to facilitate communication and cooperation, and the formal and informal relations and networks that have enabled them. Sector managers, as we explore in more detail in following sections, play an important new role as informal “boundary agents” in this new regime: similar to those described by Cash et al. (2003) who enable essential efforts at communication, translation and mediation; as well as Larner and Craig’s (2005) notion of “strategic brokers” who mediate public-private partnerships and foster new spaces of governance. In addition to issues like consolidation that have impacted other similar experiments with sector management (see van Ginkel 2009 on the Netherlands), these interviews with managers revealed the importance of trust, connections and relations; the historical persistence of management and the misfit between expectations and reality; and the changing roles of managers and fishermen themselves. As Ostrom (2010) has written, current theoretical efforts to understand collective action involve better understanding the role of trust. Indeed, past uses of social capital elements like trust have been critiqued for a circularity of reasoning that does not specify how social capital actually engenders collective action (Harriss and de Renzio 1997; Portes 1998; Ishihara and Pascual 2009). Moreover, Çalışkan and Callon (2010: 21) argue that “trust” covers only a part of the “emotional, corporal, textual and technical elements that contribute to the maintenance of markets” and “black-boxes” their actual operations. As anthropologists and social scientists, we are keenly aware of how trust and other social processes are socially constructed through everyday forms of interaction that vary across and within groups. If adaptive governance depends on processes like trust that are built up through networked interactions (Folke et al. 2005), then the historical, political and sociocultural context of such collaborative learning is also key. Thus it is surely significant that while ideas that fishermen may have about equity and fairness have mediated relations in many sectors, the development of sectors has occurred in a context in which there are no clear goals for the groundfishing industry (Singer 2011: 67) and in which a prevalent fear among fishermen is that future access will depend on maintaining significant catch histories (Brewer 2011). As initial observers noted (e.g. Holland and Wiersma 2010), sectors represent the potential for a more collaborative form of management where different sectors could be designed to achieve different goals and ways of distributing fishing access. However, sectors, whatever their overall goals, have generally distributed allocations to sector members as individual quotasb. Why sectors have not more fully benefited from the collaborative aspects of management or embraced other ways of doing business—at the same time that negative impacts have been considerable on some segments of the industry—raises acute questions for those interested in groundfish management in particular, as well as for those interested in how other shifts in management, such ecosystem-based management, may continue to devolve the scale of governance. 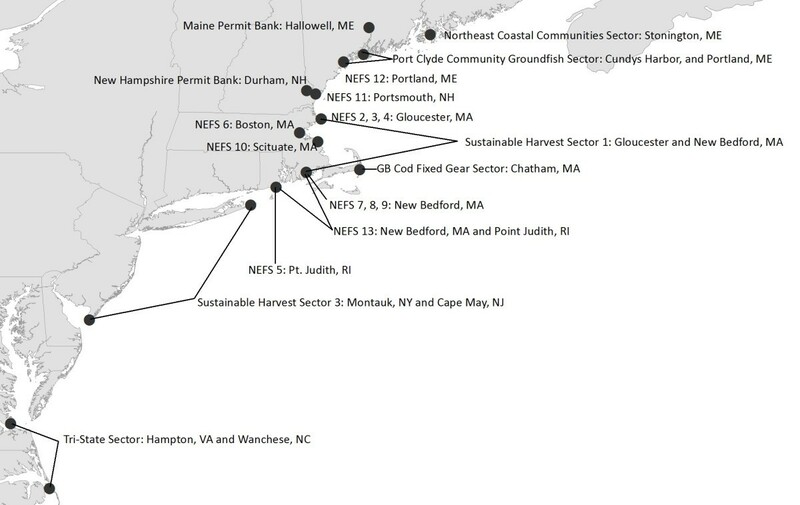 The research was part of a wider effort to document and understand the impact of catch shares and sectors on fishermen and fishing families in the Northeast US (see, for example, Clay and Colburn 2013). We are among a handful of social scientists in the National Marine Fisheries Service(NMFS) c who are charged with, among other things, investigating the sociocultural and economic impacts from different regulatory measures. The project detailed in this paper sought to understand the governance and organizational differences between sectors, as they developed out of different backgrounds and histories. Data collection included semi-structured interviews with sector managers, a permit bank manager, and the program director of the Northeast Sector Service Network (NESSN). Sector managers came from a variety of backgrounds, though most had previous professional experience or interest in the fishing industry. For example, one interviewee was a former fisherman, another was a former observer on fishing vessels, and others came from a variety of backgrounds in fisheries business, policy and research. All regular sector managers were contacted, though not all were interviewed. A total of twelve managers in charge of sixteen sectors were interviewed, covering 80 percent of the groundfish sectors. Interviews began in the spring of 2011, and due to manager turnover, not all managers interviewed are current managers. Most interviews lasted around one hour. Interviews were generally recorded if permission was granted, then transcribed and initially coded and analyzed using ATLAS-ti software for textual analysis. Topics of discussion included sector background, governance and organization, and impacts on fishermen (see the question guide in Appendix 1). Interviews and analysis were also informed by a review of Council documents, letters, and newspaper articles. Federal management of groundfish by the New England Fishery Management Council (NEFMC, or the Council) began in 1986 with the passage of the Northeast Multispecies (Groundfish) Fishery Management Plan. This plan manages the fishing of 12 groundfish species found primarily in New England waters, not including a separate amendment managing small-mesh multispecies. Until the passage of Amendment 13 in 2004, groundfish had been managed primarily through effort controls on allowable Days-at-Sea (DAS), coupled with additional trip limits, area closures, mesh regulations, and so on. Amendment 13 provided for the allocation of a percentage of the Atlantic cod quota to a fishermen’s organization, paving the way for the introduction of more such “sector allocations” to be introduced in future amendments. The implementation of Amendment 16 in 2010 codified this new system of collaborative management into the management of groundfish in the Northeast, representing a major shift in how groundfish is managed in the region. In Amendment 16, fishermen were encouraged to form sectors, each of which would then be assigned an “Annual Catch Entitlement” (ACE) based on the landings history (resulting in a “Potential Sector Contribution", or PSC) associated with each sector member. Groundfish permit holders who opted not to join any sector were allowed to remain in the “common pool” where they would become subject to former regulatory controls such as DAS. Amendment 16 saw the approval of 17 new sectors. There are currently 20 sectors, two of which are permit banks and one that is a lease-only sector (see Figure 2). Most active permit holders, i.e. those vessels with recorded landings indicating that they have fished during the year, representing the vast majority of landings history, have joined a sector. In 2011, 772 vessels with groundfish permits joined sectors. Of these 446 were active and 301 landed at least one pound of groundfish during the year. The ACE of the majority of the non-active vessels was moved to other vessels through internal sector transfers or leasing. Most groundfish vessel owners have one permitted vessel, though some own multiple vessels, including fleets of more than ten vessels (Murphy et al. 2012: 11, 78). Most important landings ports for sectors in 2010 and 2011 i . Most of the current sectors began through initial connections with more politically oriented groups. The first sector, Georges Bank Hook Sector, was established in 2004 as a pilot case in Amendment 13 to the Groundfish Plan, through the efforts of the Cape Cod Commercial Hook Fishermen's Association (CCCHFA, but now known as the Cape Cod Commercial Fishermen's Alliance) in Chatham, Massachusetts. The impetus to form this sector, equivalent to a harvest cooperative, came from an increasing frustration felt by its fishermen with Days-at-Sea management restrictions. Hook Sector organizers drew from research on and national and international examples of other cooperatives and discussed the idea of forming the sector in association meetings for several years. Their preference for a group quota system over individual ones was based on recognition, as a spokesperson explained, that fishermen would have more voice at the table if they came together as a group. The CCCHFA founded a second sector, the Georges Bank Fixed Gear Sector, in 2008 (the two CCCHFA sectors merged in Amendment 16). While the history of sector formation has been detailed elsewhere (Singer 2011), it is important to note that the formation of sectors coincides with a broader trend of increasing organizational capacity among fishermen. Many non-governmental organizations (NGOs) and other groups—North Atlantic Marine Alliance, Downeast Groundfish Initiative, CCCHFA, NSC and the Gulf of Maine Research Institution among othersd —came together during the 1990s and early 2000s to support alternatives modes of management (Pinto da Silva and Kitts 2006). As one manager put it, while members in his sector had known each other for years, they had never been organized formally before because “it is against their morals". That independently minded fishermen have begun to organize themselves more formally testifies to their acknowledgement of the challenges facing their fishing operations and heritage, and to the new importance of such connections. The first sectors thus developed in part through community-based processes, but mainstreaming the concept required mobilizing a previously disorganized group of permit holders. Taking sectors to a system-wide scale also presented challenges to the Northeast Regional Office (NERO) and the Northeast Fisheries Science Center (NEFSC), who quickly had to develop new reporting systems and associated databases (e.g. dockside and at sea monitoring, sector weekly reports) and enact modifications to the existing systems to accommodate new uses. The new sector system also required the creation of new connections and relationships between fishermen and managers. For many sectors, this was through the efforts of the Northeast Seafood Coalition, though other organizations also came to play important organizational and financial roles. Twelve of the 20 current sectors were organized by NSC (one is a lease-only sector)e. As NSC has noted (NEFMC 2012), it began to plan for sectors when there seemed to be no other viable options emerging for groundfish management. NSC began to reach out to leaders in the fishing industry, both NSC membership and non-members, identifying fishermen by geographic region, fishing gear type, fishing area, vessel size, homeport and other commonalities, then began organizing meetings, and eventually providing a template for sector organization. As one sector manager described, one of the original leaders in his sector was a fisherman respected by his peers, who knew and personally approached others about joining the sector so as to preserve the right to fish in his state. Many managers similarly noted the importance of previously established relations that made fishermen comfortable doing business together, and of key individuals who could effectively lay out options for decision-making. Managers of non-NEF sectors also noted the importance of key NGOs, philanthropic groups, and industry groups for financial and organizational support—such as writing plans and by-laws, and helping with related programs. Yet despite its grassroots beginnings in Amendment 13, many noted how the process became more top down during Amendment 16, as sectors were soon perceived not as a choice but as the only viable option. This was also found by Holland et al. (2010), where 46% of respondents felt that they were ‘forced’ into joining sectors and an additional 23% felt that it was the only viable alternative available to them. At the same time there was a push at a national level to create a catch shares policy to further their consideration in the fisheries management processf. As a recent review of experience in community based natural resource management (CBNRM) has described, there is a common tendency for universal models to usurp local specificity and meaning, often with negative results (Dressler et al. 2010). While many competing proposals were suggested by many different grassroots groups during the early stages of Amendment 16, including area management, transferable quotas, and so on, the council focused primarily on developing sectors when deadlines became pressing, such that “Suddenly, there were industry groups that were supporting very different approaches now gravitating to sectors as potentially the only opportunity for meaningful change in Amendment 16” (Singer 2011: 35). Yet this diversity—differences in goals and values that reflect “spaces of experimentation” (Healy 2009)—is to a certain degree reflected in the different sectors now operating in the groundfish industry, an issue which we address in the next section; we return to the issue of conflicting goals and objectives in groundfish as a whole in later sections of the paper. Sectors share many features, shaped as they are by the exigencies of groundfish management. In theory, each sector can tailor its internal design, catch distribution, goals, and other features to reflect the particular values and interests of its members. In addition to different goals and objectives, sectors can be shaped by the unique characteristics of their participants and the existing or evolving relationships between these individuals. Most sectors, as their original, full titles indicated, broadly share the same gear type and fishing groups, but many have also coalesced around shared qualities such as ethnicity, port location, or vision. Joint and several liability (in which all members are held liable if another sector member exceeds the sector allocation) was also a factor in sector formation and highlighted the importance of knowing and trusting the other members in one’s sector. Style of fishing and vessel similarity were also important, in part because of discard rates, as we discuss later. According to Holland et al. (2013), on average, fishermen knew 56% of their sector’s members very well, but didn’t know 35% of their sector’s members at all. The members of some sectors have very close relations: they may fish together, share a similar heritage, and even be related by kinship or marriage. In others, members may have known each other but not been particularly close, but sectors, as one manager put it, “provide an opportunity for fishermen to really know each another on a level they hadn’t necessarily before". While some permit holders had been in business with others in the past, for most sector participants the new regulations represented major shifts in how they were connected to each other. Most sector managers stated the primary goal of their sector was to help fishermen survive. Many sectors were brought together through the experience of similar problems, such as frustration with DAS, loss of fishing rights, or difficulties for small owner-operators. This took different emphases, from better using their full allocation, to sharing grounds more fairly, to improving profitability and “living within sustainable limits". Sectors that were primarily family-run businesses were more likely to be concerned about preserving fishing rights and fishing communities in their area. Many of the port-based sectors were characterized as very cohesive but certainly not all, and sectors not sharing a common geography could be cohesive if they shared something important, such as knowing each other well enough to feel comfortable and committed to working together or had a common and clear goal. However, some sectors were formed by members who did not know each other, and who came together more to avoid other sectors whose members they did not know or trust or to avoid remaining in the common pool (Holland et al. 2013). One manager alluded to pressures some fishermen may have felt to join sectors in their primary port, and another explained how some fishermen had sought specifically to avoid others with whom they could not work easily. Some have found that through meetings (especially those related to Amendment 16) their personal networks have expanded to find more commonalities with other fishermen: as one manager said, “it has become less about having common gear type and more about common goals and mind-set". Yet those who do not share or cannot build up social and other capital, struggle more. Though many sectors are trying to make something out of a difficult situation, substantial concerns and challenges remain, some of which are detailed in the final section. And despite the different goals and objectives between sectors, all of the interviewed sectors return their member’s PSC to them, effectively treating them as an individual allocation. Most sectors have a board of directors consisting of 3 to 9 officers elected by the sector members. Sector managers are responsible for day-to-day business, and in some sectors the board may also be strongly involved or consulted. Big decisions, such as electing the board or letting in new members, are generally voted on during full membership meetings, with one vote per owner, though at least one sector has weighted votes for some matters. Most have an annual meeting of all members and some meet more often, from several times a year to monthly, though attendance varies. In some sectors the boards meet several times a year, others monthly. Well attended sectors appear to be politically engaged, or heavily involved in groundfish (and perhaps also suffering more or with more at stake). Some managers have experimented with web-based meetings but found additional support necessary for such efforts to be effective. Learning how to communicate has been an unexpected challenge in creating the sector system so quickly. Since sector managers are an important boundary agent between fisheries managers and fishermen, regular communication in both directions is critical. Managers had to learn how to best communicate with their members, and solutions have varied between sectors. Some managers rely on e-mail, though as one manager put it, that was initially “a logistical nightmare” because not all members had or used e-mail. Others have found e-mail or texting ineffective when “it’s still a phone driven business” and still others rely heavily on face-to-face encounters. Both members and managers have had to adapt, through setting up new communication means, learning how to use them, and finding the right mix to ensure quick and reliable linkages. Most mangers voiced satisfaction with the use of a board of directors and the way it functions between the manager and the wider membership. Some sectors have specifically striven to ensure their boards are representative of different groups in their sector, such as different gear users or vessel sizes. Attention to structuring the board has been part of the learning process. One manager noted problems of mistrust created when membership, fearing consolidation, couldn’t trust the board members who represented primarily larger operations; they have now made an effort to make the board more diverse. Another learning issue has been problems with attendance; sectors have expanded the number of individuals serving on their boards, as well as created alternates, to ensure enough for a quorum. Some sectors also have other internal committees, such as an enforcement committee, and one sector uses a “citizen’s committee” of local non-fishermen residents who are available to mediate disputes between members. A few sector managers said that committees or groups formed around issues of interest, such as research projects or upcoming management issues, did arise spontaneously, and another noted that a number of members had expressed interest to him in their sector doing so. However, as he put it, such issues usually concerned “non sector items. People think that the sector encompasses everything […] but we only deal with allocated species and sector issues […] we don’t have the manpower to do all that stuff". This represents one of many difficulties that sector managers face taking on these boundary agent roles in a complex and challenging regulatory environment. Sectors thus display the potential for collaborative and decentralized management, but they also face many challenges and need more support, as we discuss later. Many fishermen have stated their lack of trust in the fishery management Council system and in the National Marine Fisheries Service, and have been little involved in management activities or public comment. Yet many fishermen have surely wanted effective ways to express and organize around their views, a need that newly forming interest groups within sectors now express. Yet for many of the sectors with close ties to other organizations, especially NEF sectors, the day to day work of managers and members tend to be operationally focused, not policy or vision focused, for the primary task for many managers is careful accounting of ACE usage. This means that few managers have any relationship with the Council. This re-routing of governance away from the New England Fishery Management Council to the NMFS Northeast Regional Office represents a key shift in governance relationships in the region. For example, NSC (on whose board of directors may sit both NSC-wide members and NEF sector board members) provides policy representation for NEF sector members, while NESSN (incorporated in 2011 after organizational development by NEF Sector and NSC leadership) provides technical support for its member sectors by facilitating discussion between sectors, alerting NEF sector managers to important issues (e.g. anti-trust), and providing a larger space within which NEF sectors can trade. NEF sectors have right of first offer to lease fish and right of first refusal for the sale of federal limited access Northeast multispecies permits, which means that if a sector member wants to sell either his fish or his permit outside the sector, the sector members are given the opportunity to supersede that sale, in order to keep fish within their existing fishing communities and/or the 12 sector network. The economies of scale created through this network also extend beyond trading to include weekly reports and checking quota usage and balance. This has been one major advantage of sectors forming within the NEF sector network. The network has also provided a forum for negotiating and coalition-building between NEF sectors on policy issues, extending in some cases to non-NEF sectors. One sector manager outside the NEF sectors, however, called its double right of refusal (double because the right of first refusal includes first the sector itself and then the 12 sectors in the NEF network) “a real problem” because “they have locked up two-thirds of total fish quota", making it harder for non-NEF sectors to lease fish; others saw it, however, as a way of keeping their fishing communities viable. Whether or not sectors rely on a parent organization for policy work, there are differences among sectors and sector members in the extent of engagement or interest in management in this broader sense. Some boards receive input from membership through formal recommendations, consensus statements, or face-to-face interaction. In sectors with low attendance at membership or board meetings, managers noted a number of commonalities: members who didn’t fully know each other had little sense of community cohesion, or sectors in which there was no unified vision. Indeed vision may be seen as a luxury when many are simply trying to adjust and make ends meet. Some managers noted a feeling among sector members that some of the larger organizations didn’t represent many diverse interests in the industry, leading some fishermen to feel marginalized from decision-making processes. Another factor for some sectors was that membership was geographically spread out, or that its fishermen were primarily leasing groundfish rather than actively fishing it; in both cases, there could be little interest in active participation or policy representation. A number of sector managers noted the importance of key individuals in the sector who can link the manager to other sector members; others, however, noted problems if a sector becomes dominated by key individuals who don’t represent, or reach out to, other members. Effectively identifying and resolving conflict or disagreements was cited as crucial. Lack of leadership, insufficient outreach, or ineffective communication between leaders and members was cited for lack of involvement; yet members in some relatively satisfied sectors were noted to have little interest in sector decision-making just as in sectors marked by infighting. Dissatisfaction with sector managers was also cited as a reason some fishermen move between sectors. And there is the perennial problem that fishermen are out fishing and can’t go to meetings; as one manager said: there are simply “too many issues and not enough time". Key relations also exist between sector managers. As many explained, they tend to work and trade with some managers more than others, in part due to needing particular fish but also through relations they build over time. Some managers are also more active and involved, and they may consult with each other about problems or questions, and, given a level of trust, conduct such business as trades informally through verbal agreements. Some felt that this collaboration might only be a temporary feature of the learning and adjustment period. Those who did not mention such camaraderie, on the other hand, likened their role to simply running their own business independently in that they felt little need to consult or organize with other managers. Likewise, many have found that most trading happens internally within their sector, with external trades channeled through already established relations; others found it to be “just a marketplace” that is not based on prior relations. Similarly, some leasing is arranged by fishermen in private deals, while others rely on sector managers to mediate. Managers innovated by forming an e-mail system to facilitate trading. Most noted their relations with the NERO, in contrast with the Council, as being frequent and improving. This too has been a learning process and has involved building relations over time, especially through monthly meetings. Communication with the NERO, sector managers noted, has improved as more personnel and ways to interact have developed; as one manager put it, “interaction with the NERO was difficult at first because so many infrastructural elements weren’t working…but I’ve never seen the Service more helpful than they have been with sectors". Just as relations of trust had to be built between sector managers and fishermen, face-to-face connections have been built between managers and NMFS through repeated encounters, building trust but also sometimes distrust. Virtually all managers said they had excellent relations with those staff they directly interacted, but more than a few also noted that “something happens after it has gone beyond their offices". This bureaucratic element, as we discuss later, hinders reaching fuller advantages from collaborative and decentralized management, with implications for the ultimate effectiveness of sector management. Moreover, as Brewer (2011) has written, the sector system may also decrease public accountability in that internal decision-making and other functions are less transparent than public entities, and thus can undermine the movement to co-management. Some sector managers have taken advantage of the cooperative structure of sectors, and the ensuing ability to organize themselves, to work on different policy issues. A number of sectors have members involved in research and collaborative projects, such as gear technology and fuel efficiency, especially in conjunction with groups such as the Gulf of Maine Research Institute (GMRI). One manager explained how their projects arose through joint member meetings with Sea Grant and GMRI representatives, where they brainstormed research ideas and voted on which ones to undertake. This stakeholder-driven research, he said, differs from previous collaborative research, which was top-down. However, as another sector manager noted, though some outside groups had hoped that managers would be a liaison between fishermen and researchers, this has not always been possible given their heavy workload, especially when sectors were new and many operational elements were lacking. Others also mentioned legal issues that could prevent such projects, such as insurance liabilities. Fishermen, too, another explained, may be interested in research but suffer fatigue and frustration when their work is not used in policy or assessment. Another development that a number of managers expressed interest in was in value-added activities such as local markets and branding. As one manager put it, “sectors offer flexibility to cater to local markets and understand when the vessels are landing to coordinate". Some were engaged in feasibility studies on local seafood demand and developing the necessary infrastructure (such as local processing contacts or facilities) and communication media (such as websites to facilitate education and outreach with local consumers). One sector had conducted a pilot Community Supported Fishery (CSF). Yet, for the most part, local branding or marketing was happening by individual fishermen, not through sectors. Again, one of the most important issues was the limited time, capacity, and capital to undertake such new initiatives. The sector with a pilot CSF, for example, relied on an outside NGO to run it. While managers were keenly aware such efforts could provide greater financial return for their members, it would be risky for it would require learning how to be a fish dealer, making the necessary business relations, and acquiring the necessary licenses and capital investments in infrastructure. It would also be risky because such efforts would require commitment from sector members, more difficult for small sectors or less cohesive ones, and for those whose members might be inclined to lease their allocation or who wished to retain more independence. Additionally, a number of managers noted deep concern about anti-trust laws. One sector had anti-trust monopoly language written into its operating agreement and was concerned that even individual fishermen marketing their catch might be in violation of this agreement. Another manager noted that without knowing more about anti-trust laws, his sector didn’t want to risk violations, and even a report written by lawyer hired by the NSC and GMRI to provide guidance was difficult to understand. Again, this speaks to the need for better meta-support from government agencies or other groups to better foster potentially innovative ways to sustain sector members. These elements of governance, within and between sectors, speak to the changing roles of fishermen and their intermediaries. For fishermen, the voting structure within sectors and the new positions of leadership in which increasing numbers serve, imply the potential for a greater voice in management. Some mangers also noted changing opinion of some of their members regarding sector management, from skepticism to greater involvement in its decision-making to even becoming community leaders. Most noted this was out of a feeling of necessity rather than commitment to sectors per se; as one manager put it, “individually they have no voice[…now] you speak united […] at least they are listening to us". Yet another noted, with an example of monitoring marine mammal takes with the sector’s own data, that sector members were realizing the benefits of being proactive, that “they can take a little bit of control, as a sector, of their fate". Other managers noted how independently-minded fishermen, even if they knew each other, might not have shared information or worked on shared issues to the same extent as they do now, which speaks to how new institutional arrangements may engender changing identities and subjectivities with respect to resource use (Agrawal 2003). In contrast, the provision for joint and several liabilities has influenced who wanted to join which sectors, but at the same time it has strained some existing relations, demanding self-policing and feelings of tattling that go against deeply held values. One sector, for example, had to expel a member who had been careless about his quota, but this action upset some and produced feelings of mistrust. In all this, sector managers play a key role, effectively becoming the boundary agents between sector members and government, as well as between sector members and other support organizations. Through managers, the fishing industry is working directly with the NERO to manage most of groundfish, changing the role of the Council and, to a certain extent, decentralizing some aspects of management. Moving from nearly 1,500 separately permitted vessels to 16 individuals is a significant change in how information is potentially shared, and feedback received, from industry. Managers have also had to find ways to add value to their members allocation and to help pay for their operating costs to ensure the long term sustainability of both their members and their sector. For some, this has entailed creating permit banks and increasing membership. Others have also focused on policy issues, such as working to create quota market restrictions to insure their members aren’t disadvantaged. Managers and members are writing letters to the Council or directly to its committees (such as the Statistical and Scientific Committee), to the NERO, as well as to their congressmen, through understanding the science and taking a proactive role in things before they become regulation. These are all further elements of co-management that have been galvanized through the creation of networks and the linking at different organizational levels (Rosen and Olsson 2013). Additionally, one manager believed that friction between different industry groups may be diminishing due to the role played by managers, since they can interact on their behalf, both with other managers and with government, but aren’t themselves direct stakeholders. Sector managers work for the sectors and thus can bring sector issues to the various forums in which they participate. Acting as representatives then allows for policy suggestions to be more organized and more powerful, yet, as this same manager cautioned, it is still vital that fishermen be brought to the table as well. There are many crucial challenges that fishermen, and managers, continue to face, to which we now turn. Many managers noted the initial challenges for everyone caused by the compressed timeline for sector implementation: sudden changes (e.g. reporting, setting up trading), obtaining PSC information, deciding which sector to join, technical difficulties, communication problems, and troubles interpreting the new rules and regulations. Many of these challenges were detailed by sector managers in a Council-held “Lessons Learned” workshop held in 2011g. As one manager noted, NMFS didn’t have the infrastructural support or the “people power” in the beginning to support the new system; another described the steep learning curve involved in becoming a sector manager. Most, however, noted the good rapport and communication networks that developed with NERO staffers as they all “stumbled their way through it” together. Yet many managers noted the frustration caused by persistent infrastructural issues, most especially with data redundancies and quality issues. While streamlining data processes was a priority identified at early workshops, one manager felt data issues had only gotten worse. Another manager felt that sectors from the beginning had been held to such a high standard that NMFS itself couldn’t meet. Another detailed the redundancy caused by poor NMFS data, requiring them to maintain separate books and hire staff to manage the data. Instead of multiple reporting requirements (such as vessel trip reports, dockside reports, dealer reports), one manager suggested finding ways to let sectors focus on their comparative advantage in getting fisherman-based data, while removing some of the other reporting burdens that often just repackage already existing NMFS data. Others suggested having NMFS focus on data quality and data standards, while sectors could focus on data collection to which they were better suited. On a related note, some managers noted that they filled out NMFS data requests but were unsure of the purpose for these data, demonstrating the need for better outreach and involvement. Finally, one manager said their biggest challenge was “answering to two masters", with the agency increasing their workload and using them as the liaison to sector members, when managers “work for the sector, not the agency". The new system has posed many challenges for fishermen. Given that the sector system started in a period of declining total allowable catches (TACs) and the introduction of restrictive annual catch limits, many fishermen have had to deal with low and decreasing allocations. With the abundance of some stocks in the groundfish complex expected to remain low in the near future, these difficulties are likely to continue. While sectors have many potential benefits, such as the ability to target a market or spread out landings, according to sector managers many fishermen have not been in a position to realize such benefits. Although some have argued that continued management through DAS would have been more onerous, and indeed most managers believed their members were also unhappy under the DAS system, nonetheless the low allocations combined with transferability have had many predictable effects common when resources become privatized (see Olson 2011). One of the most important is the issue of consolidation (Kitts et al. 2011). As one manager described, some groups of fishermen were better able to take advantage of the sector system: those with relatively larger and more diverse allocations, and who had a stronger capitalized base, could more easily buy fish from those with fewer options, driving consolidation. Many managers noted that smaller vessels or operations in particular have had problems affording higher prices and buying quota. Smaller vessels are also disadvantaged by the lack of any baseline restriction on the leasing market, as in DAS leasing. This, as one manager stated, “doesn’t recognize the difference in purchasing power and access to capital, [which] puts smaller boats at a disadvantage". Moreover, many smaller vessels were also disadvantaged by allocations based on catch history during 1996–2006, when measures such as trip limits and rolling closures had greater effects on certain segments of the industry. There is a widespread sentiment that allocations have favored the larger, more rapacious fishermen. As van Ginkel (2009: 284) has written of the Dutch experiment with sectors, while many fishermen have been pleased with the more participatory nature of management, it has come with “considerable ecological and social costs”, including such concerns as highgrading of catch and concentration of ownership. The combination of an allocation too low to fish profitably and/or too little cash flow to finance leasing creates a downward spiral, as decreasing profits increasingly cut away at available funds. The response in the first year in particular was characterized by managers as one of shock and of paralysis. But, as another explained, those who dared to go fishing amidst the paralysis got better prices and did well. “If you don’t have the finances, you can’t play this game”, as one manager put it. It is also relatively more risky for those with less adequate finances, for there is no guarantee that leased fish will be profitable or even caught. More than one could tell of fishermen who leased high and landed when prices were low, going out of business. Leasing, as one manager described, was “out of control” with prices too high for smaller operations to afford. Managers noted the increasing stress and family problems that have resulted from financial difficulties and worry over overfishing. Some fishermen have tried to adapt by selling their vessels and then working for others. One manager noted how impacts also extend beyond many of these smaller businesses, often family-run, who have had to let go crew they have fished with for years. Another manager related how some fishermen, out of a deep sense of personal responsibility, have tried to keep their crews by leasing more, but with increased leasing costs still a negative factor on both owner and crew. Yet it is not only small-vessel fishermen who have had to adapt. Fishermen who had designed their businesses around DAS, for example, may have had to sell some vessels at a loss to adapt to the sector system. Many voice worry about shouldering the costs of at-sea monitoring and the continued uncertainty over who will pay. A fear of what the future will bring, in terms of a changing policy environment as well as fluctuating allocations, creates uncertainty and difficulty in making business decisions. As another manager described, the new fishing regulations require a new way of thinking: those who are able and willing to adapt and take a long-term view will benefit, but those who don't will lose out; but as this manager continued, many fishermen are no longer willing to adapt anymore. Conversely, some managers noted that the sector leasing system has made it more profitable for some fishermen to treat their allocation as an “annual annuity” rather than fish it. Though sector allocations are not officially individual permanent allocations, more than one manager described the “ITQ-think” (for Individual Transferable Quotas, or privatization of resources) that developed during Amendment 16 proceedings, in which some fishermen were encouraged to think about sectors as individual quotas. In contrast, the initial interest in sectors had been much broader and was thought that individual sectors could tailor their allocations to their own goals and objectives, such as profit-sharing (Holland and Wiersma 2010). Indeed one manager felt it would cost less and be easier to manage community quotas than individual ones. But others described how leasing itself encouraged thinking about sectors individually, since it helps create a race to buy and sell before prices change, and encourages a sense of entitlement to a particular allocationh. The spatial distribution of fish and the mix of species within an allocation have also been important. Day-boat fishermen, for example, with smaller vessels might receive allocations for species that can’t target, whereas the price of species they do target can easily be driven up by other fishermen to cover their bycatch. As one manager explained, one “driver of consolidation” is that larger vessels can afford to lose money on secondary species, even when it’s not priced at its shadow value, but which they buy to go fishing on their primary interests. It’s “quite dramatic how this has separated the ability for these small vessels to participate in the quota market and compete with these larger vessels”. As another manager said, “They’ve created this commodity market for people who basically did nothing. It was never that type of market when it was DAS…some people are reaping the benefit and some people are paying through the nose”. Moreover, smaller vessels are more sensitive to finer scale issues such as local depletion in their traditional fishing grounds; larger vessels can benefit more if and when total abundance rises, whereas smaller ones need a fuller recovery of the stocks in the local areas in which they fish. Indeed, as Acheson (2011: 70) has explicitly written, from “the perspective of small boat operators in Maine”, the disappearance of the option of area management from Amendment 16, such that fishermen can fish anywhere they want, “means that the large boat owners from southern New England have been able to get the rules they wanted again”. Additionally, different fishermen (and different sectors) may not fish groundfish exclusively, and the seasonality of different fisheries may make following strict timelines for groundfish sectors more difficult. For example, those who are done early in the season are disadvantaged by not knowing how much quota they can carry over, whereas those who fish later in the fishing year may scramble to catch their full quota. Many fishermen are also concerned about being locked out of fisheries when access is based on recent history; they can’t move into them when different species are doing well and groundfish aren’t. Sector management seems to amplify the effects of single-species management on fishermen, for as Brewer (2011: 15) has written, fishermen must “negotiate for access to paper fish, suppressing their own observations of fish life histories, spatial patterns, and inter-species and habitat interactions” because “Many fear that not catching the maximum limit could jeopardize future individual allocations because days-at-sea are based on catch histories, and individual quotas would likely be allocated similarly”. As Berkes (2004) has argued, while “mutual learning” and “trust building” are both key to adaptive co-management, they take time to develop and cannot be imposed. Managers provided many ideas about ways to improve the sector system, but more than one noted how sectors are embedded in a large bureaucracy, i.e. NMFS and the Council, that cannot collect or respond quickly to new information, so that the purported benefits of the sector system are harder to materialize: “We have this sector system designed to react to things happening on the water and it’s being hamstrung by a management and monitoring system that is years behind”. Many noted with frustration that suggestions on ways to improve or incorporate new information and studies were not acted upon. A number of managers pointed to inequities from assumed discard rates, and suggested better observer coverage to base discard rates on actual practices. Generic rules neither encourage accountability nor reward stewardship, creating lost opportunities to encourage collaborative management. An example that another manager provided is hand gear, which has an assumed discard rate of 50%; this manager believes the penalty assessed to that gear will eventually eliminate the gear from the Northeast, despite studies showing high survivability of released juvenile fish. Others questioned the need for any observers given the design of sectors to encourage joint liability. And one pointed deeper to what he believed were flaws in the Magnuson-Stevens Fishery Conservation and Management Act, the primary legislation governing federal management of fisheries in the US, and that a new commitment to participatory governance and ecosystem-based management was needed, not micro-management of individual species. One avenue was thought to be better capitalizing on bottom-up data that sectors and fishermen could provide, as a first step in bringing stakeholders and scientists together. As this manager put it, “We can’t base this all on scarcity and fear; we have to base it on abundance and hope”. The sector system was introduced to manage groundfish in the Northeast US with many promised benefits. Yet in the first few years of sector management, as interviews with sector managers have revealed, the accrual of these benefits has been uneven. Certainly, some groups are well on their way to capitalizing on value-added pursuits that sector management is supposed to better enable. Others were overwhelmed and didn’t know where to begin. Given the importance of formal and informal relations, those with the least, in terms of both financial and social capital, seem to have fared the worst. Yet many factors have been important, such as the amount of allocation, the strength of support networks, and the need for business relations and acumen. Fishermen of different ages have faced differing challenges, with younger fishermen discouraged from entry and older fishermen concerned about being able to retire. Moreover, sectors have had different levels of outside support and funding. Such asymmetries are a barrier to the full realization of sector potential. It seems that many have assumed that sector managers could be tasked to do things without full consideration for the support they might need to be successful. Yet sectors are also a new form of environmental governance in Northeast fisheries. Both formal and informal relations and networks have been critical to creating new institutional forms of communication and cooperation, and in which the scope of management activities has broadened. Sector managers as boundary agents have played a new and crucial role in creating new alliances and networks of environmental governance in the groundfish fishery. We have noted in this paper the need for further support and greater flexibility to sectors and to sector managers. Yet success means different things to different people. Sectors have been saddled with conflicting goals and objectives, with expectations to be both economically efficient vehicles of quota allocations, and institutions to promote cooperative and devolved management. Given the expectation that maintaining catch history is critical to resource access, it is not surprising that only one of these expectations has gained the most ground. aThe implementation of this program was complicated by the assessment of overfishing on most species in the groundfish complex, expected reductions in available quota, and the further need by law to set annual catch limits (ACLs) and accountability measures (AMs) for fisheries subject to overfishing. bWilson and Jacobsen (2013) have argued that the ability to communicate and to reach resilient management solutions depends on not “reduc[ing] discussions of complex systems to simple categories”, and suggest further that sector management in New England may represent a flexible “boundary object” since the actual content of sector organization is not imposed. However, the similar adoption by sectors to distribute their allocation on an individual basis, despite no requirement to do so, speaks to how the flexibility of a boundary object also depends on the context in which such communication occurs, a more general point to which we will return throughout the paper. cThe National Marine Fisheries Service (NMFS), part of the National Oceanic and Atmospheric Administration (NOAA), is the federal regulatory agency that oversees fisheries management in US federal waters (the 200-mile Exclusive Economic Zone, excluding state waters from shore to 3 miles). NMFS has six regional offices and six regional science centers across the country that provide fisheries policy assessment and advice, and which also participate in analyzing fishery management plans formulated by the eight regional fishery management councils. In the Northeast US, this includes the Northeast Regional Office (NERO), the Northeast Fisheries Science Center (NEFSC) and the New England Fishery Management Council (NEFMC). eThese 12 sectors are referred to as Northeast Fishery sectors (NEF) II through XIII, which are distinct non-profit 501(c)(6) organizations. Members of all NEF sectors are represented by the NSC on policy matters concerning the groundfish fishery. fSee http://www.nmfs.noaa.gov/sfa/management/catch_shares/index.html (accessed 7 November, 2013). gSee http://www.nefmc.org/nemulti/cte_mtg_docs/111025-26_sector_ws/111025-26.html for documents provided by all sector managers. Concerns expressed ranged from the difficulties facing fishermen to data issues and communication problems, echoing issues raised in the interviews we conducted. hNOAA has been at pains to emphasize that sectors are not ITQs since they don’t represent a permanent allocation to a vessel (see for example http://www.nero.noaa.gov/sfd/Amend16Docs/Reply%20to%20NB%20reply.as%20filed.3.2.11.pdf, accessed December 5, 2013). What is significant in this case is not only the concurrent efforts at a national level to articulate a policy that promoted the consideration of catch shares more generally for fisheries management, but the history of mistrust characterizing fishermen-federal interactions in New England, which only intensified a desire to maintain one’s catch history (see also Brewer 2011). iNote: Landings include all species, not limited to groundfish. Permit bank location is based on office location. How was your sector formed? How would you describe your membership? Are there other groups that have been important for forming or running your sector? How are decisions made in this sector (e.g. one owner/one vote)? What different roles or structures have you created for running your sector? How are these decision-making and other activities working out for you? Have there been key individuals instrumental in the organization of your sector? Have your members expressed interest in taking on more decision-making in the sector? What are the particular goals of your sector? Have there been particular problems you have encountered in trying to meet your goals? What solutions would you offer for these problems? Have there been, or does it look like there will be, any major changes in your membership? Are there members of your sector that have benefitted more than others from being in a sector? What do you think is the ideal composition of a sector? What are the costs of sector membership? What services to members get from sectors? Can everyone afford the costs? Does your sector interact with/trade quota/exchange information/cooperate in some other way with other sectors? Which ones, and why? Relationship with Council/Regional Office - is this changing over time? Does your sector have any marketing activities? Has your sector worked on creating ties between fishermen and consumers? Has your sector worked on creating or changing ties between fishermen and dealers or processors? What other activities does your sector engage in? We would like to thank all the sector managers who graciously took time out of their busy schedules to meet and talk with us, and Matt McPherson, who participated in a number of the interviews and helped to craft the interview guide. Thanks to the editor and the two anonymous reviewers for helping us to clarify and deepen our argument. Any misunderstandings are of course our own. The information in this paper does not reflect, represent, or form any part of the support of the policies of NOAA or the Department of Commerce, nor imply that NOAA or the Department of Commerce agree with the information contained herein. JO and PPdS both carried out interviewing, compiled and analyzed data, wrote the manuscript, and read and approved the final version.